Recently Assam Judicial Academy has issued a recruitment notification for filling up various posts. According to the Judicial Academy Assam Recruitment 2017 Applications are invited from the citizens of India as defined in Article 5 and 6 of the Constitution of India for filling up the following vacant posts in the establishment of Judicial Academy, Assam. Reservations would be as per existing Rules. Last date for submission of applications is 10.12.2017 till 5.00 p.m. 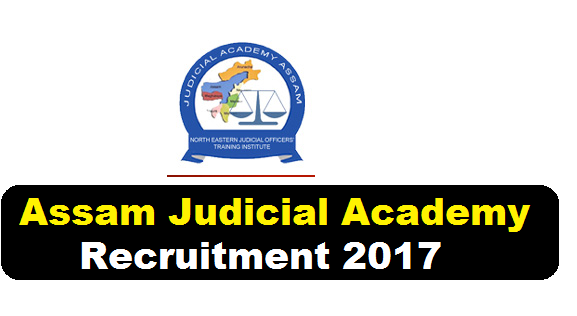 Following are the details of the posts under Judicial Academy Assam Recruitment 2017 with post details, number of vacancies, age limit, salary, required qualification with application details. Educational Qualification: Graduate with computer knowledge and Shorthand speed of 100 w.p.m. and computer typing speed of 40 w.p.m. with minimum experience of 5 years in the profession. Educational Qualification: Graduate with Shorthand speed of 80 w.p.m. and computer typing speed of 40 w.p.m. having computer knowledge and good academic record with minimum experience of 3 years in the profession. Educational Qualification: Graduate with computer typing speed of 35 w.p.m. and must have knowledge of computer having Diploma in Computer Applications from reputed Institution. Officers of Central/State Government or Universities holding analogous Post. Desirable: Knowledge of Computer Applications in a library. Educational Qualification: Candidates must be Graduate with 7 years’ service in the establishment of Gauhati High Court/ District Court/NEJOTI with proficiency in Computers. Educational Qualification: Candidates must be Graduate with Diploma in Computer Application. Educational Qualification: Candidates must be Matriculation or equivalent from a recognized Central or State Board having valid driving license for light motor vehicle. Educational Qualification: Candidates must be Matriculation or equivalent from a recognized Central or State Board. Educational Qualification: Candidates must be Minimum 8th standard pass but shall not be a graduate. Educational Qualification: Candidates must be Matriculation or equivalent from a Recognized Central or State Board and having experience of cooking from a recognized Institution. Age Limit : Minimum age for all posts is 18 years and maximum age is 43 years (General), 46 years (OBC/MOBC), 48 years (SC/ST) and 53 years (PWD). The candidates must attach an Indian Postal Order (IPO) for Rs 250/- (Rupees Two hundred and fifty only) for General Candidates and Rs 150/- (Rupees One hundred and fifty only) for SC/ST/OBC/MOBC candidates payable to Judicial Academy, Assam at Guwahati. Interested and eligible candidates are required to submit application in prescribed Standard Form. Candidates shall fill the Application Form and paste his/her recent passport sized coloured photograph in the given space of the application form and shall sign across the photograph. The envelope containing the application form along with other relevant documents should be dropped in the DROP BOX labelled “DROP BOX OF APPLICATIONS FOR VACANT POSTS OF JUDICIAL ACADEMY, ASSAM” kept in the Office of the JUDICIAL ACADEMY, ASSAM, 7 BHOLANATH MANDIR PATH, DR. B.K. KAKOTI ROAD, ULUBARI, GUWAHATI- 781007. Applications submitted in any other mode, except as indicated, will be summarily rejected without any communication. he list of the candidates, with allotted Roll Nos. will be published on website of Judicial Academy, Assam – http://jaassam.gov.in for reference of the candidates in due course and no separate Admit Card/Calf Letter shall be issued. Candidates are required to regularly visit the Notified Website of Judicial Academy, Assam. Candidates applying for more than one post should fill up separate application form for each post. Candidates already in Government service must apply through proper channel.